C Turtle was released August 2, 2010 and is the second ROS distribution release. It is mainly an incremental update to the libraries already released in ROS Box Turtle. 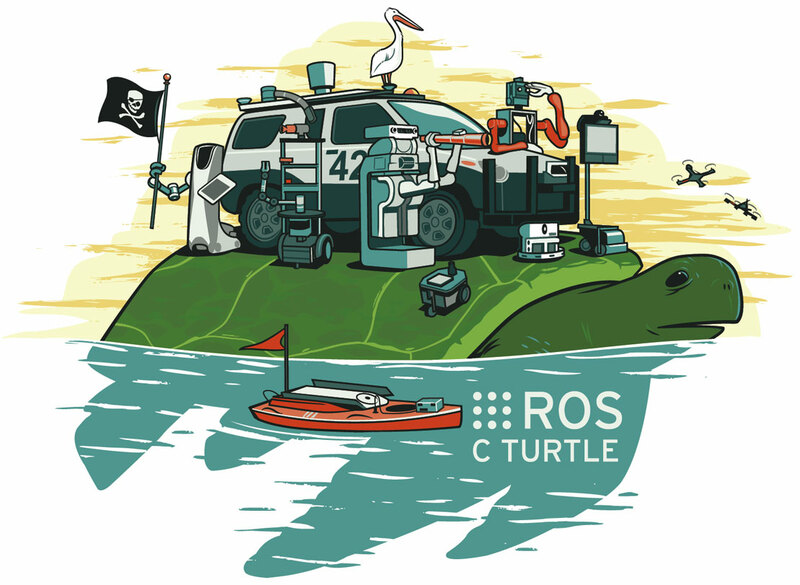 ROS C Turtle is primarily targeted at Ubuntu Jaunty through Lucid releases, though it can also be installed on various Linux systems like Red Hat, Debian, and Gentoo. It can also be used on OSes like Mac OS X and FreeBSD, though with more limited compatibility. See the installation page for more details. base: Robot-generic, building block libraries, like the ROS navigation stack, as well as developer tools like rviz in the visualization stack. pr2all: Experimental libraries for the Willow Garage PR2 robot, as well as ongoing research code. ROS C Turtle includes nearly twenty new stacks, though these are all still considered unstable. These new stacks mainly focus on 3D perception, manipulation, and grasping. It is recommended that users exercise caution when using stacks that have not reached 1.0 status. Pre-1.0 stacks are likely to undergo significant changes as we focus on stabilizing them for ROS Diamondback Turtle and subsequent releases. Stacks in the base variant are generally very stable and consist mainly of robot-generic libraries, developer tools, and drivers for common hardware. The pr2 variant is intended for users of the PR2 robot and mainly consists of stable, PR2-specific libraries. In the future, some of these libraries may become robot-generic. The following stacks are provided in the 'pr2all' variant. These stacks are generally unstable and are very volatile. Subsequent ROS distributions may include these stacks in the "base", "pr2" or other variants as they stabilize. The major changes for the stable stacks in the ROS C Turtle release are summarized below. Python messages are now pickle-able. Major performance improvements to message serialization. roslisp has now been moved into the ROS stack. roslisp is a full-featured Common Lisp client library for ROS. To avoid a dependency on the sbcl compiler from the ros stack, there is a dummy package roslisp_runtime in the roslisp_support stack. Packages that use roslisp should declare a dependency on the roslisp_runtime package in their manifest. This will cause sbcl to get downloaded and built into the sbcl package. Examples of use are now in the roslisp_tutorials package in the ros_tutorials stack. rosnode info now works for roslisp nodes. Message objects are now immutable. Debug output can be set with ros parameters, and reset during execution with a service. Compilation of .lisp files now happens during build. New <arg> tag, if/unless attributes, and $(arg) features. default cwd for nodes is now ROS_HOME. Use of ros-root option is now deprecated. This change was made to prevent issues with core files being generated by nodes. rostopic/rosservice: improved YAML compatibility of output to support YAML-encoded storage of messages. internal reorganization to support rxgraph changes. xdot: (New package) Provides xdot.py, by Jose Fonseca, plus Jon Bohren's wx wrapper for it. rostest: added --bare options for running bare, non-node executables with a time limit. New C++ and Python iterator-based API's for reading and writing bag files. A major revision to the bag format including (optional) compression. Appending, and simultaneous reading and writing of bag files now supported. New commands: compress, decompress, and reindex. rosbag info shows more detailed statistics, and uses index rather than reading entire bag. Added -e and --exclude options for rosbag record to record topics using regular expressions <<Ticket(ros 2487)>>. Rendering back-end upgraded to Cairo. A new status bar at the bottom with the current build status and build times summarized. The option --status-rate=STATUS_UPDATE_RATE can be set to 0 to suppress this in a non-interactive build. No longer assumes -lboost_<library>-mt for system installs, and will error if it can't find a specific library. New commands: --version and --print_versions. The first prints the version it will use, the second prints all versions it finds. rosdoc: added support for INCLUDE_PATH (thanks snorri) and exclude_patterns for Doxygen configuration. Moved in from camera_drivers_experimental, contributed by Jack O'Quin. Facilitate driver handling of the set_camera_info service. Moved in from camera_drivers_experimental, maintained by Jack O'Quin. This is a generic Firewire camera driver. Now uses recommended syntax package/name to get rid of global namespace. nodelet: (New Package) provides dynamic loading of multiple nodelets within the same process for high efficiency message passing. New more capable sensor_msgs/PointCloud2. Message review notes. runtime_monitor and robot_monitor now work as rxbag plugins. Functionality is still experimental. diagnostic_aggregator now has DiscardAnalyzer and IgnoreAnalyzer to help set up different robot configurations. Deprecated the dynamic_reconfigure/SensorLevels message. Use the one in driver_base instead. Added an automatic dependency generator for .cfg files. eigen is now 2.0.15 + fixed a bug regarding the use of MatrixXf in SVD/eigenanalysis. Better error output on failure, particularly when a file cannot be opened. Added image_transport-specific exceptions. Subscriber throws TransportLoadException if it fails to load a plugin. Share class loaders among all publishers and subscribers created with a single ImageTransport instance. Avoids duplicated calls to rospack. Removed deprecated SubscriberFilter methods taking a raw NodeHandle instead of an ImageTransport. Added getTransport() method to the subscriber classes, returning the name of the transport actually being used. Set projection matrix P correctly in monocular calibration (<<Ticket(ros-pkg 3684)>>, <<Ticket(ros-pkg 3975)>>). Calibration no longer makes hard-coded assumptions about checkerboard dimensions and corner spacing. Fixed to work with arbitrary size images, not only 640x480 (<<Ticket(ros-pkg 3951)>>). Wait for set_camera_info service at startup, error if it doesn't become available (<<Ticket(ros-pkg 3977)>>). Throw out images with corners very close to the image edges; can cause bad calibration (<<Ticket(ros-pkg 3980)>>). Mono calibration now reports linear error of the rectified checkerboard corners (<<Ticket(ros-pkg 4035)>>). Updated cameracheck to work with stricter topic name checking (<<Ticket(ros-pkg 4036)>>). camera_hammer utility for testing a set_camera_info service call. Added a simple calibration script (camera_calibrate_from_disk.py) that loads a set of images from disk and performs monocular calibration returning the camera intrinsics. Can initialize calibrators from CameraInfo messages (<<Ticket(ros-pkg 3891)>>). Fixed possible crash when changing the encoding of the raw image stream (<<Ticket(ros-pkg 4252)>>). Many improvements to the OpenCV stereo block matcher used for computing disparities. Uses capped X-Sobel operator as the prefilter - quick to compute and doesn't expand edges. OpenCV now implements speckle filtering. Removed junk disparities at the image edge. Improved stereo interpolation to reduce "waviness." Added points2 topic with the new sensor_msgs/PointCloud2 format. Upped texture_threshold maximum to 10000; high values needed for simulated stereo images. Made some methods of StereoProcessor public so e.g. a Videre STOC driver can user them. image_rotate: (New package) visualize camera streams in an orientation that is more intuitive to the user than the hardware-constrained orientation of the physical camera. This is particularly helpful, for example, to show images from the PR2's forearm cameras with a consistent up direction, despite the fact that the forearms need to rotate in arbitrary ways during manipulation. Added a get_id utility so that scripts can obtain the hardware ID of an IMU. Add a parameter to bring up imu without calibrating it. Instead, the imu will assume it is already calibrated. Add a check for drift at the end of calibration Ticket 4093 to detect cases where the IMU was moved while calibrating. Added the --redirect-output option to ease logging when run in background. Added the --no-disable-bluetoothd option to allow coexistence with a properly configured bluetoothd. Added an --inactivity-timeout command-line argument to allow automatic unpairing after an extended period of inactivity. This should help preserve the battery life. Added various schemes to prevent the driver from silently becoming unresponsive to connections. Merged in support for the Nunchuck, contributed by David Lu. Added ~angle and ~resolution parameters to allow the scan range and resolution to be set. Added a getFirmwareVersion tool so that scripts can verify the firmware version on a laser. Added angular version-dependent range limits for UTM-30LX in intensity mode to avoid getting incorrect data or crashing. Added an allow_unsafe_settings parameter to disable these limits. base_local_planner: TrajectoryPlannerROS now exposes a checkTrajectory function which allows users to check if a given velocity is legal. Added a clear_unknown_space service to move_base that allows external users to clear unknown space around the robot in the costmap. Adding a make_plan service to navfn that allows the use of the planner via ROS. Differences between Boxturtle and C-turtle's new PR2 beta meshes. added param gazebo/start_robot_calibrated for toggling calibration in simulation. defaults to true, which is the original behavior. add exports to and add direct dependency on gazebo for the new gazebo-ros node (no longer need to set LD_LIBRARY_PATH for dynamically loaded plugins). Parser follows urdf spec more closely: deprecate floating joints and reference_position. Correctly support partial trees, trees with only fixed links and trees with 1-2 links. added camera synchronizer node, allowing turning on/off texture projector. assimp based mesh loader (with Collada support). Supports ODE and bullet physics engines. Supports GPU shaders: per-vertex lighting, per-pixel lighting, normal and tangent maps. added imu calibration service call, does nothing and returns true. (in support of simulating full robot startup calibration). Updated to Stage 3.2.2 as the underlying simulation library. Added transform logic to support upside-down lasers <<Ticket(ros-pkg 3052)>>. Still needs to be tested on a real robot with an upside-down laser. Added publication of filter entropy, for use in SLAM-aware exploration. Added ~occ_thresh parameter, to allow control over when a cell is determined to be occupied. Removed deprecated APIs from sound_play. TRIANGLE_LIST uses existing members to show arbitrary "triangle soup", with each three points generating a triangle. TRIANGLE_LIST marker type for displaying "triangle soup"
Support for per-point color for POINT, CUBE_LIST, LINE_LIST and LINE_STRIP markers. Does not yet support per-point alpha though the capability exists in the message. Added Frame Timeout option which will fade out frames that have not received data within a certain amount of time. Defaults to 15 seconds. Updated to OpenCV rev 3090, new flann patch. The following stacks are new in ROS C Turtle. They are currently unstable and are only meant for early adopters and developers who wish to contribute to their future development.